I have made a short sell natural gas futures trade. My entry price was 3.51 at 23:25 my time. Before I get into the details of this trade, I should mention that I was very recently long natural gas. I was stopped out of my long trade at a reasonable profit by my trailing stop. I am now of the opinion that the short term trend has reversed, and so I entered a short sell at what I thought was the first reasonable opportunity. There are some factors relating to the trend reversal I believe is underway that influenced my decision to go short that I will discuss further down the page. It relates to an unclear MACD divergence on the 60 minute chart. I will point it out in the chart and discuss it below. Regarding my current trade, it is an example of swing trading. I observed what I believed to be the beginning of a new trend downwards, and I waited for prices to approach the moving average I have set on the 60 minute chart to enter my trade. Let us now observe the 60 minute futures trading chart for November natural gas futures. The yellow arrow indicates my short entry point at 3.51. As you can see, prices approached the moving average (yellow line), and I saw this as my opportunity to get prices high-ish for the overnight period. I am hoping for prices to make a new low during tomorrow's day session. In addition to being close to the moving average, setting me up for a swing trade, the daily chart (not shown) shows prices to be quite high relative to the recent past. This just adds to my bearish attitude and encourages me to look for a short trade here. I entered this trade just before midnight on Monday, Oct 15. Normally, for natural gas futures, I wait to make my trades in the early morning. This usually occurs at around 5 to 7 in the morning. Tonight, I decided to enter early because, well, I had a gut feeling. This might bite me in the A$$ come morning time. I have my stop loss set so as to limit my risk exposure, and we will see if my analysis and gut feeling will prove profitable. If not, then I'll lose money and wait for the next trade. So be it. 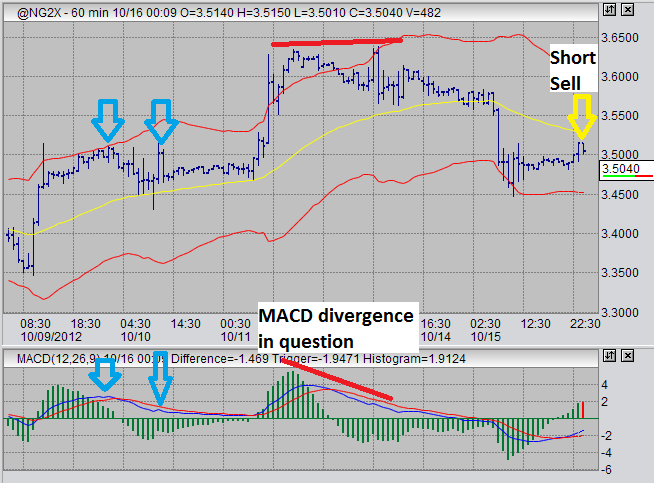 The two red lines indicate the MACD divergence in question. If you look closely, you'll notice that the price did make a very slightly higher high towards the right-end of the red bar. MACD did not. This is an MACD divergence. The reason I didn't sell my long position on this signal, and even enter a new short trade, was that I had seen the previous example of this situation. It is marked with blue arrows. As you can see, it is almost a duplicate. The only difference is that prices did not make a new high, by a very small margin. Anyways, this situation befuddled me a little, and I chose to wait it out for more highs and let my trailing stop loss do the work. It did, and a cost. I still made profit, but I could have made more. You can't win them all. This whole situation serves to reinforce my belief in the strength of MACD divergences, regardless of how subtle they are. In other markets, I am pleased with the way gold is behaving and I am patiently waiting for the time to be right to make my long entry in gold futures. I am very seriously considering entering a long sugar trade at this very moment, but I think I will wait to see how tomorrow plays out. I could easily see myself regretting this decision to wait and not buy sugar futures at this very moment, we'll see.